...that distinguishes us from our competition. Richard L. Benes founded CMC in Cleveland, Ohio in 1964. The company relocated its corporate headquarters to Colorado in 1972 and is now operating under the direction of two generations of the Benes family. For over 45-years, CMC Group, Inc. has performed design-build and general construction projects across the U.S.
CMC maintains an agreement with Varco Pruden Buildings systems located in Missouri, a division of Blue Scope Steel. This partnership allows us direct purchasing power and streamlined deliveries for pre-engineered projects. This alliance is useful in providing our customers economical structural solutions as well as GREEN and LEED related solutions. For more information about our partners, see links below. Recent news articles about CMC Group, Inc.
CMC makes room for "little guys"
CMC is a member of the The U.S. Green Building Council. The Council is the nation’s foremost coalition of leaders working to transform the way buildings and communities are designed, built and operated, enabling an environmentally and socially responsible, healthy and prosperous environment that improves the quality of life. 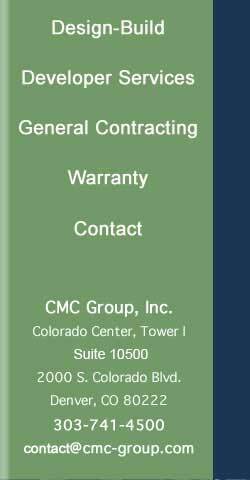 The CMC-Group, Inc. website is best viewed with the following web browsers listed below. Newer versions of Microsoft IE, Firefox, Chrome and Safari are supported. Internet browsers are free. Use links below to download lastest versions of your favorite browser.